ibVPN is one of the major VPN providers in the market with over 9 years of experience in coding and designing internet privacy tools. This is an additional advantage to the company as it gets to know what an excellent web service should provide its customers. The services offered by ibVPN allow you to browse the internet securely and invisibly without being tracked and without leaving a trace by self. Once you install ibVPN software in your computer, all the programs on it will start functioning through the VPN automatically, thus making sure that you get the highest level of anonymity and security. ibVPN provides an All In One VPN package for Windows, with which you can connect to every protocol (PPTP, SSTP, L2TP, and OpenVPN), every VPN server location, and every setting with a simple click. This ibVPN review contains all information you need to know about using this VPN service. Ultimate VPN: This package provides you with the access to 620 dynamic IP addresses from 57 servers located in different countries around the world. It also includes access to torrent servers in 3 countries and proxies in 8 countries. Ultimate VPN package costs about $10.95 per month, $24.95 per 3 months, $42.95 per 6 months and $82.95 per year. Total VPN: With this package, you will have access to 620 dynamic IP addresses again from 38 servers located in different countries across the globe. Total VPN costs $7.95 per month, $19.95 per 3 months, $36.95 per 6 months and $69.95 per year. Regional VPNs: ibVPN provides separate VPN services for different regions such as the US and Canada, the UK and Ireland and also for the EU. Each of these packages provides access to different numbers of servers and IPs. However, the pricing remains the same. 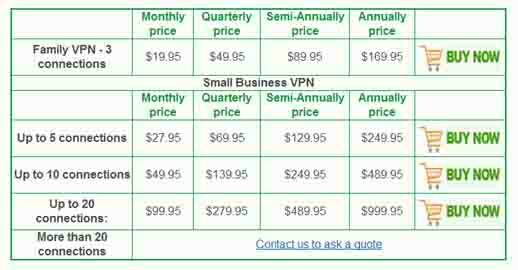 Regional VPNs cost $4.95 per month, $10.95 per 3 months, $19.95 per 6 months and $36.95 per year. Another excellent feature of ibVPN is that you are offered a 6 hour free trial for Standard VPN packages and a 2 days free trial for Multi VPN packages. These free trials come with access to all of the servers of the company and are absolutely enough time for you to know about the working of the VPN service. You are also provided with a 15 day money back guarantee on purchase of any account. Overall, ibVPN is one of those unique VPN service providers with outstanding features, offers and prices.